After getting back from the camp, the sky became extremely dark, with thick clouds moving over us. A little later, it started to rain. We’re lucky that our little huts have a good roof, insulated with UNHCR green sheeting. We have continued to get wave after wave of bugs, all shapes and sizes—crawling kind, jumping kind, flying kind—they keep coming at us in this little hut. It still feels like home, with the three of us on computers, and cameras and other gadgets all over the place. It’s hard not to trip on one chord or another. Day 4 was a full day at a camp. We check in through the multiple layers of registrations, as Connie described on her Journal yesterday, but after that we walk and make it through the camp on our own and not the part of a tour. The people we meet have no idea that we’re coming, and we usually catch them as they make it through their normal routine: women building their fences, braiding each other’s hair, or preparing a meal. As everyone notices when watching the videos, there are very few men in the camps. If we notice it with our eyes, I wonder how the hearts and souls of these survivors experience that void. Back at our home-base, our little hut full of machines, we get to work. We write, download pictures and video, and we make sure everything is ready to go for the next day. The editing takes me hours—long hours. I have to download all the footage taped at the camp, and this is downloaded in real time. As it comes down, I look and make notes about what I might want to use for the day’s i-ACT clip. It is quite a challenge to decide what to pick. I wish I could share every child’s face with you. We go to sleep late at night, and it’s actually more like early in the morning. YL fell asleep in his chair, with his head resting in his arms over his computer. As I was shutting my MacBook, YL was waking up and starting to type away, as fast as Connie is slow, as if he did not miss a beat during his sleep. If you find a face that you like from Day 4, please do at least one thing for him or her today. Take at least one action that might help them go home. Do it as if that face belonged to someone whom you love dearly. I’m pretty sure that you don’t even have to pretend. It’s impossible not to love these faces and the people behind them. Muy padre el video, que gusto da ver otra vez alas personas que atravez de I-ACT hemos conocido que bien que podamos volver a verlos. Viendo este video 4, Connie muestra la cocina y me vino una pregunta, estan usando las estufas solares? ya vez que han hecho tanto esfuerzo por ayudar con esto, estan funcionando? Gabe, Las camisetas de The Genocide Intervention Net. llegaron 2 dias despues que ustedes se fueron asi que hoy voy a usar una de ellas, no te importa? Great video!Cant wait until tommorow to see the next video.Even though I miss you alot but Im glad your there, so I can see all the beautiful faces of wonderful people.I dont think that all those wonderful people should live in pain. While reading everyone’s journals, one word keeps jumping at me. A word we all take for granted. That word is home.. I never think of it, but imagine what it would be like not to be able to go home ( I can’t). These people can’t go home, they have nowhere to go. Everyone should be able to go home. What more can we do to make that happen??? I liked the video.But it was painfull to see how they live.I think me Mimi are lucky to have such a good life. What beautiful faces, such an ugly and tragic crisis. Gabe, as some of these people greet you for the second and third time, do you think they understand your mission, why you come to their camps? And why all our good wishes and work for them has, so far, come to nothing? 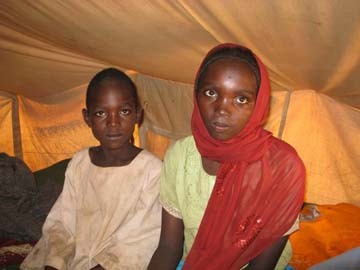 I know your heart aches that you are returning to the camps, instead of to their reclaimed homes in Darfur. Thank you for carrying your concern and ours into the camps. Do you find the same number of humanitarian workers in the camps? Is security noticeably different from your last trip? How nice but heartbreaking it must be to see so many familiar faces. While our lives change so much back home there is the continual endurance of conditions beyond our dear friend’s control daily there. The loss of spontanaity and choice is a devastating phsychological crime. May your days be dry and nights be bug free as you keep up the difficult work. The footage and the connections/interactions are simply beautiful, guys. Even though Meron and I will gang up on you in a nano-second (oh and the matching t-shirts are lovely and tidy – nice to see you made an effort :), no other jokes today, my friend. The connections and re-connections you made today are as heart-warming as they are heart-breaking. Take care and stay strong – all of you. Today’s video is very powerful. The interview with the young lady is heartbreaking. You can see in her eyes the longing to go back “home” and sense the hurting and she does not ask “if” they will go home but rather “when”. It seems they all have the strong belief that they will be going home and that “we” will do somthing to fix the problems in Darfur. Your being there let’s them know that they are not forgotten and people are trying to do something to get them home. Gabe, we know that there is more women and children in the camps than men and I did not see any in today’s video. Do you see less men than in your past visits? It was touching to see the response of past acquaintences as they recognized you, even though you may not have been expected. Stacey must be so glad to have all their smiles relayed across the miles, knowing friends are safe, but, like all of us, sad they are still enduring such deteriorating conditions. It must get increasingly difficult for you to not to have more positive news for all of these displaced and suffering. They have been blessed with resiliency beyond measure, but carry pain not many could ever fully imagine. Continue your journey with care — you know you have prayers floating all around you (not just bugs!). I just returned home from my mother’s 80th birthday celebration where there was food, family, friends and gifts aplenty and every one had a home to go home to when the party was over. One of the first things I did after getting myself settled in for the night was to watch your video for today. Very powerful, indeed. It has reminded me to be very grateful that I am surrounded by loving family & friends and have the comfort of home. 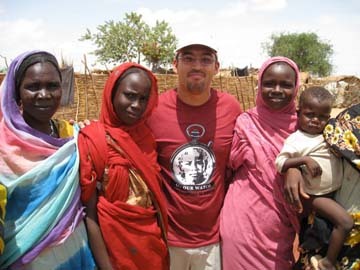 It also reminds me that I MUST continue to support efforts such as i-ACT and your action suggestions until the right to safety, home and family is returned to the people of Darfur. We’ve all just come back from seeing the latest Harry Potter movie ….. too late for the little ones to watch i-ACT Day 5 tonight but the “grown-ups” are about to watch before heading out for dinner. ….. with timezone difference and the like, I think I might be ahead of the Day 5 video being loaded up. I’ll check after dinner and before bed.